An easy autumn vegetarian menu that’s perfect for Thanksgiving or any fall dinner. Recipes for Roasted Butternut Squash Soup, Harvest Salad, and Eggplant Lasagna. Lately we have been trying to get together with my family for Sunday family dinners. It’s such a fun and relaxing way to get the family together when we are all so busy during the week. I thought that entering elementary school (just for my big girl – little one is still in preschool) would mean more free time. I was so so wrong. Not only does kindergarten mean for the first time school 5 days a week, but we have swimming lessons, singing class, and ballet x 2. We are constantly on-the-go, so it’s nice to relax, cook, and eat on Sundays. Last week we had my parents over and I made a make-ahead Autumn meal. All I had to do before dinner was bake the lasagna, warm up the soup, and pull the salad out of the fridge. We picked the cutest, most funny looking, butternut squash from the backyard and turned it into soup. They were like a little squash family. This autumn salad has all the right elements: crunch from the nuts and pomegranate seeds, sweetness from the grapes and apples, and a salty bite from the cheese. Assemble this salad early in the day, cover with plastic wrap, and refrigerate until ready to add dressing and serve. There are no after shots of this for a reason. We all devoured it! Luckily I was able to get an in-progress shot! And dessert… well, I picked up a chocolate pie because it was hubby’s birthday and it’s his favorite. And because sorry, but Mama can’t always do everything. This is a versatile soup recipe. Free to add additional vegetables like turnips or carrots, or to use other sweet winter squash like delicata. The soup can be made a day in advance – after pureeing, store the soup in the refrigerator in the blender. Before serving, heat soup in the pot and stir in the broth, nutmeg, and salt and pepper. Preheat the oven to 400 degrees F. Place squash, onion, apple, and garlic in a roasting pan. Drizzle with olive oil and toss to coat. Tuck sage leaves under the squash mixture. Season with salt and pepper. Roast for 30 minutes or until tender and slightly caramelized. Cool slightly and squeeze the bottom of the garlic to remove the roasted cloves. 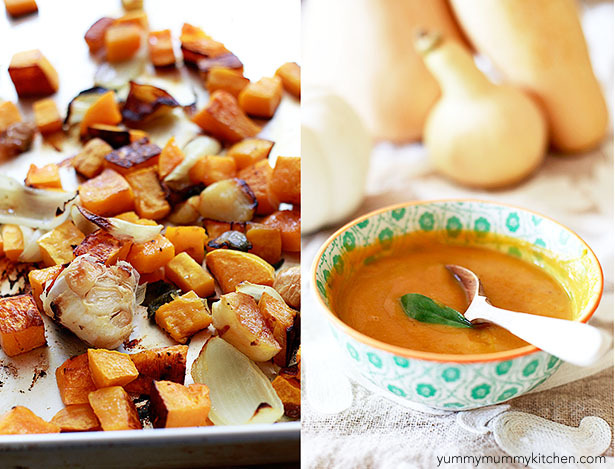 Transfer the roasted squash, onion, apple, and garlic to a blender and puree. Pour into a stock pot and whisk in broth and nutmeg. Simmer over low heat and add salt and pepper and more nutmeg if desired. Serve soup and garnish with pepitas (pumpkin seeds), chopped hazelnuts, creme fraiche, or brown a little butter and fry sage leaves. 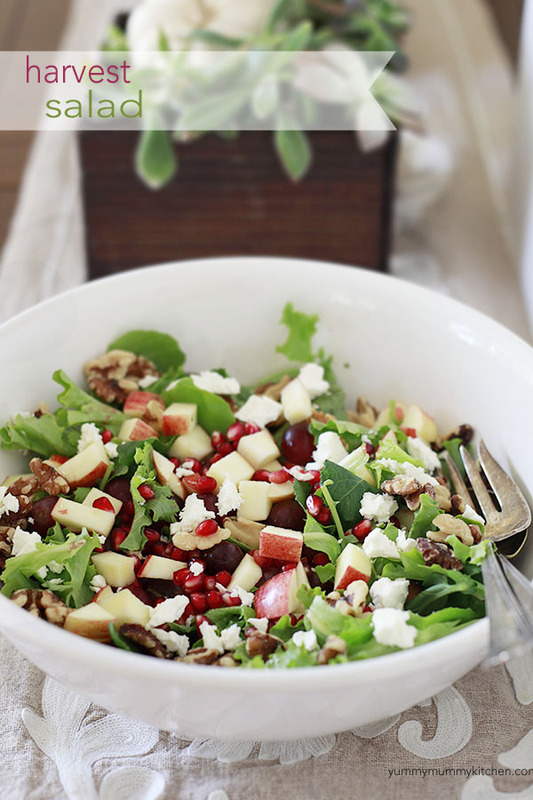 Place greens in a salad bowl and arrange grapes, pomegranate seeds, apple, walnuts, and cheese on top. Toss with dressing just before serving. If you want a shortcut, Trader Joe’s sells sliced and grilled eggplant and zucchini in the freezer section that works very well in this recipe. Because this recipe requires several steps, I make it early in the day and bake just before dinner. Lay eggplant strips in a strainer and sprinkle with salt. Rub salt on both sides of eggplant. The salt will remove some of the bitter water from the eggplant. After 1 hour rinse eggplant and pat dry. Heat olive oil in a skillet or grill pan over medium high heat. Cook eggplant strips until just tender, turning occasionally. Set aside. Cook lasagna noodles according to box directions. Set aside. In a medium bowl, whisk together the ricotta, egg, Parmesan, and pepper to combine. Sometimes I add a little chopped fresh parsley or basil, sometimes I don’t. Coat the bottom of a 9 x 13″ casserole dish with about 1/3 of the sauce. If using sausage add half to the sauce. Cover with lasagna noodles. Spread half of the ricotta mixture over the noodles. Place 1/3 of the mozzarella slices over the ricotta. You can tear the mozzarella into smaller pieces to cover more of the ricotta. 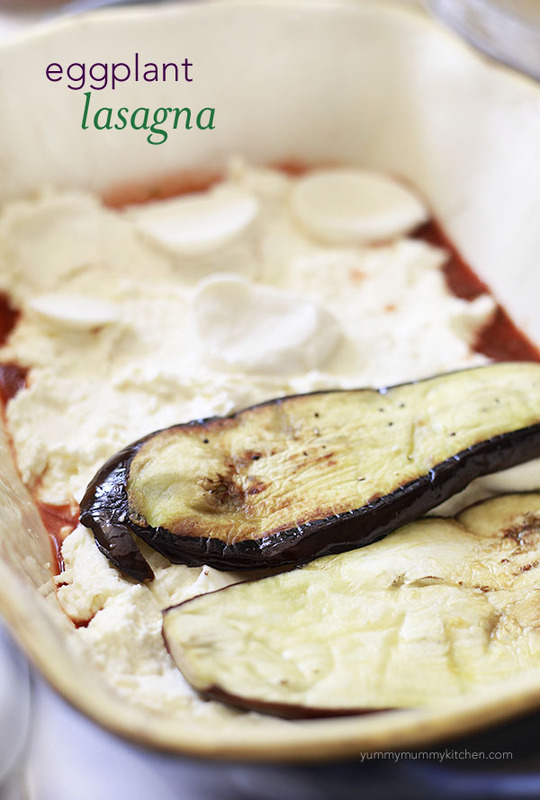 Cover the cheeses with one layer of eggplant. Pour half of the remaining sauce (and sausage if using) over the eggplant and layer with a second layer of noodles, the remaining ricotta, half the remaining mozzarella, and another layer of eggplant. Top with a third layer of noodles, and then the remaining sauce. Scatter the rest of the mozzarella over the sauce. Bake immediately or cover with foil and refrigerate until ready to bake. Preheat the oven to 400 degrees F. Bake covered with foil for 30 minutes. Remove foil and bake for another 15 minutes or until sauce is bubbling.